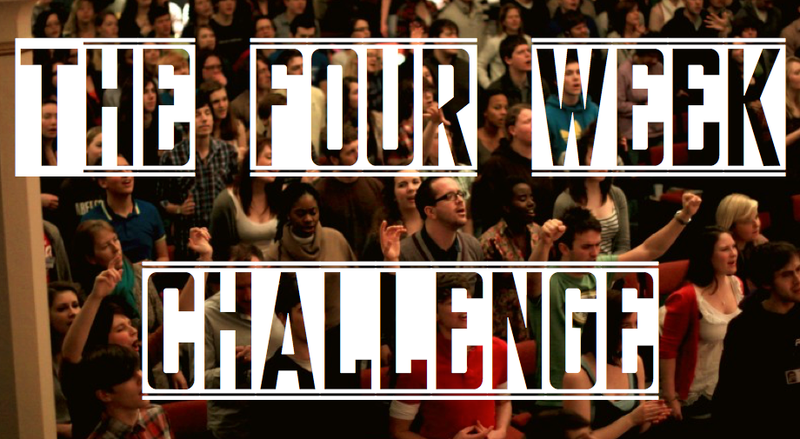 Can You Handle The Four Week Challenge? When was the last time your whole family made it to church all four Sundays in a month? It seems like an easy question to answer, at first. But then you remember that your son had a basketball tournament two weeks ago, and in January you were out of town for New Years–which was a Sunday. And Christmas was on a Sunday in December…hmm. And what about those weeks when you just couldn’t get all the kids out of the door because one was sick, or you were up late Saturday with an infant who cried all night? When I first came to College Street, I found some curious score cards in my filing cabinet. They had a checklist of things every attendee was meant to do/bring (offering, Bible, a friend, etc.) adding up to a highest possible score of 6 points per card. I was rummaging around in our church attic (don’t ask why) and discovered the mother lode: Sunday School Banners. 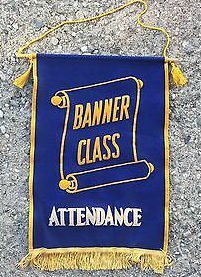 Apparently it was a kind of competition back in the day, each Sunday School would try to have the highest score week-to-week in order have a banner day of sorts. It actually is important to make a habit of coming to church week after week. In an effort to avoid even the appearance of legalism–as though merely coming to church somehow secures you a seat on the great pews in the sky–I wonder if we have fallen off the horse on the other side. How many of us these days consider gathering with our church to be an essential/non-negotiable in our weekly rhythm? It actually is important to be with the church when she gathers. Even in the first century, believers were getting in the habit of neglecting to meet together. So again I ask, when was the last time you and your whole family made it to church four consecutive Sundays? Are you in the habit of missing church at least once a month? Twice a month? How on earth will your church grow to the maturity Paul envisions in Ephesians 4, if the pastors and leaders cannot even convince the whole body to sit together for one hour a week? I challenge you to get your family to church–the whole family (dad, mom, and the kids)–for four weeks in a row. It’s a simple goal. Nothing extraordinary. But for some of us, this will take Herculean effort. It may mean skating in late one week. It may mean dealing with obstinate kids who don’t want to go out the door. It may mean rearranging your weekend plans. But it will be worth it. Who knows? Maybe it will be the beginning of a new habit. When you make it a habit to be with the church weekly, it will benefit you, your family, your church, and your pastors–guaranteed. Talk to your husband. Talk to your wife. Talk with your kids. Are you up for the challenge? I’ll leave you with a little quote from our church covenant. Is this the desire of your heart? Next Post Who Needs ‘The Shack’? We’ve Got Abraham, Isaac, and the Servant!